Thank GOODNESS I scanned it awhile back to have the size! 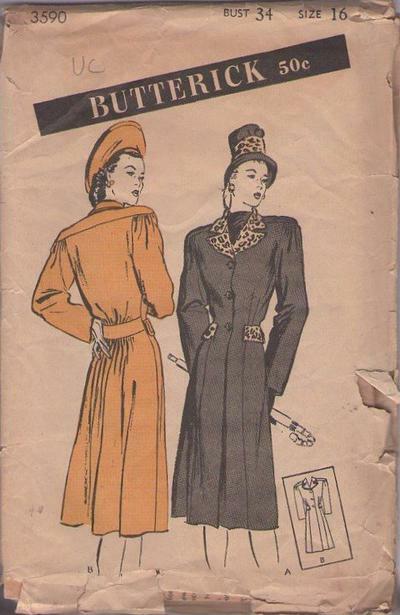 1945, 40s Winter, Retro Outerwear Clothing Patterns - Women's and Misses' Coat: Back Fulness.This youthful fitted coat has distinctive epaulet shoulders; high three-button closing; inset belt across the back accenting the fulness and the bloused above the-waist look Fur or fur-fabric collar, revers, and flap pockets are optional. CONDITION: This Original Vintage Sewing Pattern is unprinted and appears to be unused. All pieces appear to be complete and intact and have been neatly refolded with the original instructions. Envelope is aged and fragile with edge wear & tear.